The Konica Minolta Gator Bowl game (named after its title sponsor Konica Minolta) is an annual college football bowl game in the post-season and usually takes place in early January (usually on New Year's Day) in Jacksonville, Florida. For the last several years (to be exact: since 2007), the game featured the 3rd place team from the ACC (Atlantic Coast Conference) against a team from either the Big 12, the Big East, or Notre Dame as an Independent. From 2010 on the Bowl will be played between a SEC team and a Big Ten team, joining the Capital One Bowl and the Outback Bowl as the third Big Ten-SEC bowl match-up on New Years' Day. Started in 1946 this college bowl game is the 6th oldest of all the college bowl games. Over time it also became one of the biggest games - with attendance consistently reaching about 70,000 spectators. In 2010 the following teams will be matched-up: The Florida State Seminoles, representing Florida State University (FSU) from Tallahassee, FL, in the ACC vs. the West Virginia Mountaineers, representing West Virginia University, Morgantown, WV in the Big East Conference. The title sponsor is Konica Minolta Holdings, Inc., which is a Japanese manufacturer of office equipment, medical imaging, graphic imaging, optical devices, and measuring instruments. We know them mainly for cameras and copy/fax machines. In the very beginning the Bowl was played at Fairfield Stadium, which became the 'Gator Bowl' Stadium, but in recent years it was eventually moved to Jacksonville Municipal Stadium, starting January 1996. It's an amazing stadium, right next to St. Johns River in Jacksonville, Florida. The stadium has a capacity of over 67,000 seats, but can be expanded for special events, then holding about 84,000 spectators. 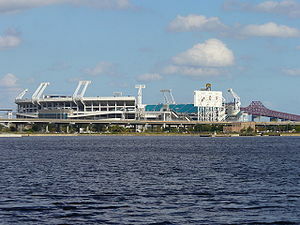 It is also home for the NFL Jacksonville Jaguars. Buy your Gator Bowl Tickets now before it is too late and be one of the tens of thousands enthusiastic fans in this awesome stadium.